Yesterday I flew to Las Vegas, NV to spend the day with my brother Sam. 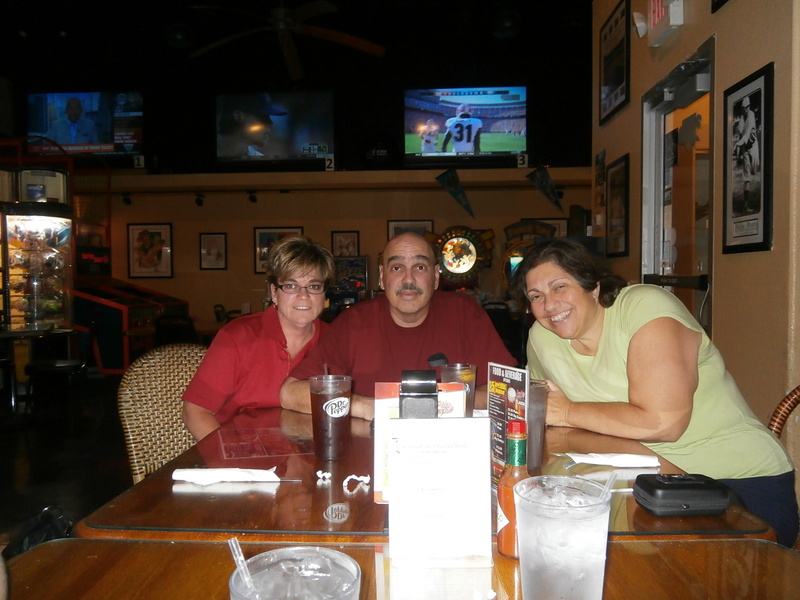 Almost two months ago Sam was involved in a solo motorcycle accident and nearly died. He spent 32 days in a hospital trauma unit in San Diego, CA most of that time spent in a medically induced coma. Mike and I were living in Spain when he had his accident. Sam is incredibly lucky. He was not paralyzed; his broken ribs, punctured lung and fractured orbit surrounding his right eye have all healed. The brain injury he suffered lingers. Doctors say that many people take up to a year to recover from such a dramatic brain event. I flew to Vegas for a few reasons. One being to see him for myself and second to see the therapy he is receiving. He receives therapy in balance training, strength training, brain exercises, brain cognition and counseling for how to assign, relate and deal with living with a brain injury. As is quite common Sam kept asking when he could return to his normal life. He was frustrated with the therapy because he didn’t see the value in it because it had no bearing on helping him get back to work. What he missed, and what I foolishly forgot to say to him, was that they were doing therapy that would help his whole life, not just his work life. Because the therapists didn’t know Sam before his accident they have no way of knowing what he was like beforehand. I was asked from time to time to tell them if Sam was acting the same as usual or was he different. I told them Sam looked tired and even a little sad. I told them that our father had instilled into each of his children (there are 5 of us) an incredibly strong work ethic and Sam was just doing that which came naturally to us all, he spends his time working hard. 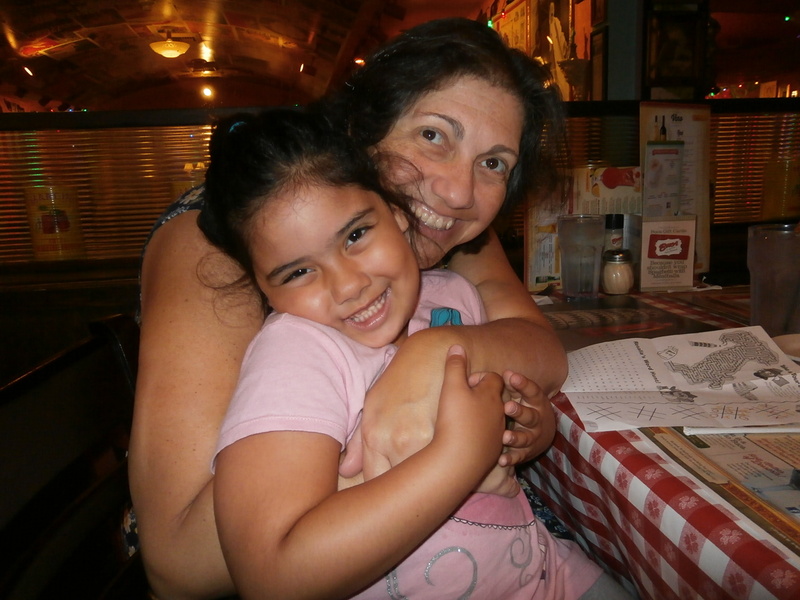 It was while I was hearing therapists talk about what Sam’s new normal life would look like that I realized that there was a lesson in there for me as well. In all my past jobs I would work 60 hour weeks and think nothing of it. I would work hard and vacation hard but I worked harder. I realized that a real work life balance needs to exist; I realized that in the blink of an eye the so called normal life we all think we have could change instantly and perhaps permanently. I realized that if my whole life was my work life I had no real life and no real balance to that life. Brain injury patients, depending on many factors, make remarkable recoveries and might have some lingering impairments but nothing that they can’t be taught how to compensate for or how to reassign their brain to help them get the job done. Sam will work hard to make a full recovery. I know my brother. I know how determined he is to get back to his normal life. I will be praying that he gets his wish. It will take a lot of hard work and dedication from everyone who loves him and perhaps even more so from those that work with him. For me I will try to remember the lessons I learned that day as I move forward and I look for work. I will remember that at the end of the day a job helps me pay the bills and helps me take those great travel adventures Mike and I still want to take. I will try to remember that when I’m not at work those hours are for me to do as I please and for Mike and I to have some fun. I will try to sit and read without thinking about how much work I could be doing; I will go out to movies and social events and make more of an effort to have a social life. While Sam might have been the one who received the blow to his head I received my own wakeup call that day. I have decided to work hard, but laugh harder. I have decided to work hard, but live harder. And mostly I have decided to work hard, but love family and friends harder. My husbands high school reunion is being held in Bonney Lake, WA on August 2nd. Since we were going to be attending many of the people from his high school befriended me on Facebook so that we could get acquainted before we arrived. I received dozens of nasty comments, such as I needed to stop drinking the Kool Aid, I didn’t have an original thought in my head, Obama was the worst President ever, a liar, a non-friend of the military and more lies than heard on the lips of Jim Carrey in the movie Liar, Liar. Some of the commenter’s then began to sing the praises of the anti-Obama propaganda movie currently being shown in Seattle called America. Oh, and none of these people were racists, they told me so. Because I love my husband I did as he requested and deleted my reply to the personal attacks they directed towards me and their insulting rants. I did the only thing that would silence such uneducated louts and I un-followed and unfriended almost everyone who chimed in because they were of the same ilk. I’m sure they are still congratulating themselves that they chased me away. What they foolishly do not know about me is that I will have the last word. I decided that commenting and getting into a discussion with those who have no rational thinking process and who do not believe or deal in facts would be a complete waste of my time, so I deleted them all. I have had enough of racism in my life. While living in Salem, Oregon I was cautioned not to walk around the city without my husband because I am Mediterranean in complexion and he is a light skinned blue-eyed man and therefore I would be safer with him in tow. I never once left the apartment without him. During our time in Salem, and during the Christmas season, we had a food bank tell us that they wouldn’t give food to anyone who was Mexican because they were all in Oregon illegally. Really? Your good Christian self thinks that all Mexicans are illegal? These were not the type of Christians I wanted to associate with. Mike and I found another way to help and we adopted five families that Christmas. Traveling the way we have been traveling for the last three years has done more for me than I first realized. I have always detested racism and the veiled way people think that they hide their racist nature behind fake laughter has always rankled me, but I did nothing about it and I said nothing to them. Because of the repercussions I have seen where racism went too far will I no longer let racism slide by without taking a stand. 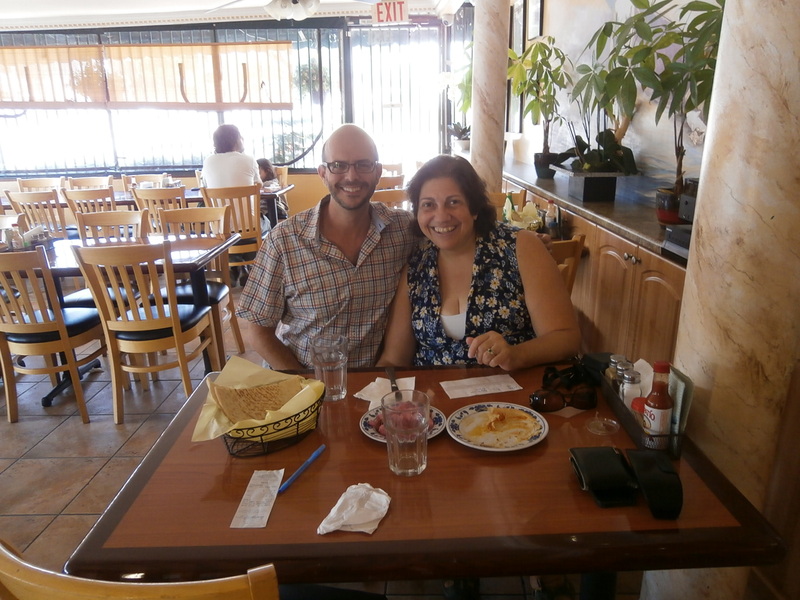 During our travels we had people from around Latin American ask us what was wrong with the people in the US because no one ever asked them what country they were from, if Americans heard Spanish spoken they just assumed that everyone was from Mexico. Do not be fooled into thinking that Mike and I spent our time defending this behavior, we did our utmost best to make sure that people in other countries did not think that all Americans were as uncouth. Because of how we treated others people assumed we were from Canada because we were open to exploring new countries and new cultures. After talking with us they knew we weren’t the typical American and they told us so. We didn’t have a superiority complex or a chip on our shoulders and we treated others with respect. We were open to new experiences; new adventures and we were open to all people and all races, and with all manner of lifestyles. There comes a time when those of us who are confronted with blatant hatred, hidden in the mask of humor, we must stand up and say enough is enough. I guess I have reached that point in my life. The best way to deal with racism is to silence it and I intend to silence as much of it as possible. I had always thought that having more Americans travel the world would be a good thing but perhaps it is better that so many of them stay at home. So much of the world already thinks that Americans are gun toting trigger happy fools, greedy, selfish to a fault and ignorant about world events. There is no reason for any of these people to travel the world and prove them right. Racism is an ugly thing. Many Americans, thank God not all, think they are superior to others. I have news for them; they aren’t superior to anyone. Living in the Pacific Northwest will be a mind-field for me I fear. It might however make me speed up the need to leave the US again and live someplace else in the world. I have therefore decided to take a stand on social media. You have the right to post anything on your social media that you like. If you decide however to post anything that is homophobic; racist; or harmful to children I have the right to delete it and you from my life. That is the stand I take. I will not confront you, I will not send you facts or data or proof of the error of your ways. In this way, and if more people turned off the hatred instead of answering to it, racists will cease to have an audience. And that will make them crazier than anything I could say in rebuttal to their stupidity. Come this August, and for the first time in 3 years, I will be looking for work. We have been traveling internationally this whole time. Because a resume is a list of jobs one has held and its death they say to have gaps in your employment history I know for my resume I’ll put those 3 years down as life experience. During our time away we traveled to 4 continents and over 24 countries. I have photographic and video proof of where we’ve been so when a job recruiter tries to search for proof of my claims they will be able to see it on my YouTube channel. I’m rethinking the traditional job search thing however. I’m going to approach my job search like I am planning a really great vacation. I have come to realize that work is a lot like travel planning. You pick the occupation you are interested in, you plan how to get there, you gather the resources you need to get the job done and you go and enjoy your time within its walls. No longer is a job someplace that I need to be just because. A job is to help me get the resources I need to keep traveling. We won’t be buying a home when we get back to the US, we will rent so that we are free to move around if need be. We won’t have a car to further burden us so that we can experience how the locals live by traveling by bus or walking everywhere. We won’t be buying groceries or supplies in bulk but we’ll live in a small apartment with very little furniture and we won’t be going on shopping splurges to fill closets with items we can’t pack into a suitcase. Ever present will be the life on the road mentality where we can pack up and go when vacation time comes and we’re not stressed out about having to protect the valuables we leave in our apartment because there won’t be any valuables in our apartment to worry about. I therefore need a boss who knows that I’m going to work hard. I’m going to be one of the hardest working people they have on staff because I’m also going to be the employee with their eye on the main prize, my vacation time. I need a boss who has lots of projects they need done because I’m a fantastic multitasker who can plan, organize and facilitate events and projects better than most and I’m not shy about knowing my worth to an organization. My work history is filled with my success in a myriad of industries. There might be gaps in my employment history because of the all the travel however I think in many ways this has only sharpened my employment skills. I know the real worth of social media to a business and I know how to generate it. I know the real worth of life on the road and how to get others excited about travel. I know that working hard can lead to travel to fun and new places. Mostly what I have learned however is empathy; I have learned about different cultures and its people and what their struggles and concerns are. I can talk to people in a very different way from many because I have lived with and among them and my perspective on things is different than most. To many businesses this should be of huge benefit. Therefore if you have a job that you need a highly motivated employee for contact me; if you have a job that others have tried to master but failed at contact me; if you have a job that might seem too wild to contemplate then contact me. I need a challenge; I need a new adventure to sink my teeth into; mostly I need a boss who can see the value I bring to their organization. I have about 10 years left in my working life, longer if I find the right job and the right boss. I know the right job fit is out there for me just like I know that I’m not done traveling yet. I guess what I really need is a boss who likes getting post cards from great travel destinations. Who Needs Two Buck Chuck*? 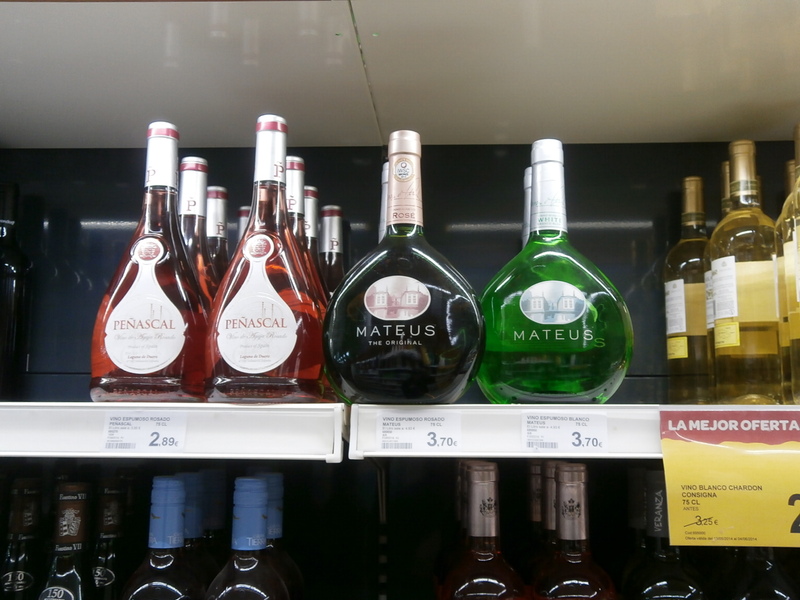 On the shelves of our local grocery store here in Torrevieja there is one of the widest selections of wines we have seen thus far in our travels. The prices are amazingly low. 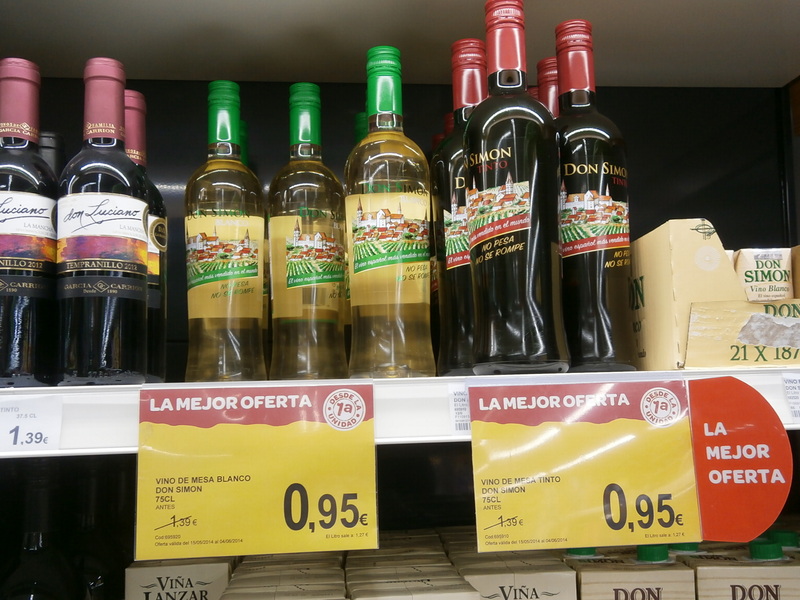 You can get a bottle of wine for less than a $1. All of these wine bottles made me wonder more about Spain’s wine industry. Spain has 2.9 million acres of land planted with grapes to produce wine. Spain is the most widely planted wine producing nation but it is the third largest producer of wine in Europe, behind France and Italy. This is due to the very low yields and wide spacing of the old vines planted on the dry, infertile soil. The drought currently affecting Spain is also hampering wine production and articles appear almost daily about Spanish wine producers seeing record low yields. It will not be the first time in Spain’s history that drought or climate change has had an affect on wine production. Spain reportedly has over 400 varieties of grapes but only 20 varieties of grapes are used for wine production. In a country that has been producing wine since 4000 – 3000 BC the abundance of native varieties of grapes fostered an early start to viticulture. 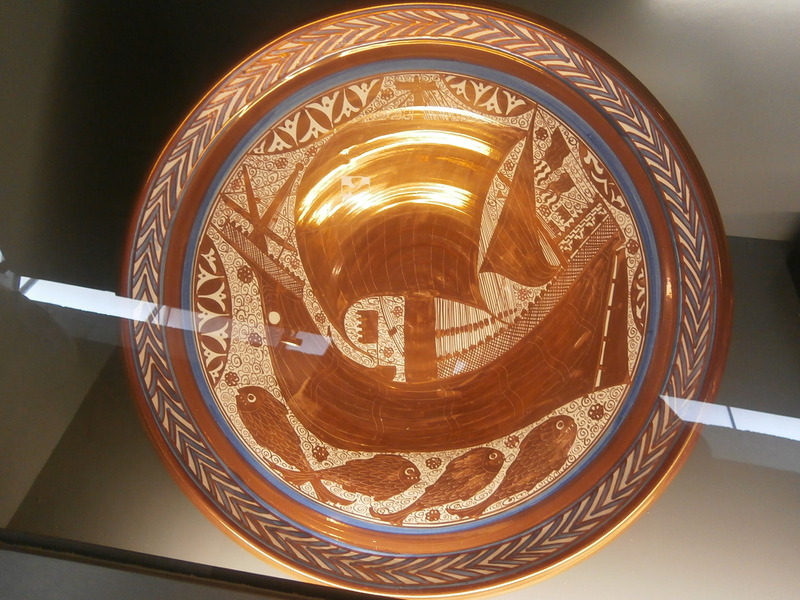 Spanish wine under Roman times was widely exported and traded. When the Moors conquered Spain in the 8th Century the Moorish rulers held an ambiguous stance on winemaking and even though it was not an accepted Muslim practice many caliphs owned vineyards and drank wine. In 1492 grape vines and wine were exported to the new Spanish Colony in the New World. In the 19th Century a phylloxera epidemic hit European vineyards causing a shortage of wine. The epidemic hit Spain last but the remedy of grafting American rootstock to the European vines had already been discovered and saved the wine industry. During the Spanish Civil War and World War I and II wine production ground to a halt and many vineyards were neglected and wineries destroyed throughout Spain. It wasn’t until the 1950’s that the Spanish wine industry recovered. Several large wineries were founded during this period and an international market was created for bulk wines. The full bodied and high alcohol in most Spanish wines make them favored blending partners for the “weaker” wines of other countries. Many Spanish vineyards will be planted on higher elevations, with many vineyards located over 2,000 feet (610 m) above sea level. These high altitudes allow the grapes to maintain acidity levels and coloring. Regions with lower altitude vineyards are suitable for producing grapes of high alcohol levels and low acidity. As of 2009, there were 79 quality wine areas across Spain. For the vintage year to appear on the label, a minimum of 85% of the grapes must be from that year’s harvest. There are three accepted aging designations on Spanish wine labels. They are: Crianza – red wines aged for 2 years with at least 6 months in oak. Crianza whites and rosés must be aged for at least 1 year with at least 6 months in oak. Reserva – red wines aged for at least 3 years with at least 1 year in oak. Reserva whites and rosés must be aged for at least 2 years with at least 6 months in oak. and Gran Reserva – wines in above average vintages with the red wines requiring at least 5 years aging, 18 months of which in oak and a minimum of 36 months in the bottle. Gran Reserva whites and rosés must be aged for at least 4 years with at least 6 months in oak. By the way, the favored oak used in fermentation is American oak which tends to bring with it a rich and nutty flavor. Cava, the most famous sparkling wine in the world after Champagne, makes its home near Barcelona. Spanish wine makers must be doing something right because in 2013 the number one wine on the Wine Spectator Top 100 was a red Spanish wine from Rioja. It was the first time in the history of the Top 100 that a wine from Spain has been the top wine of the year. In wine circles this is like an Academy Award. 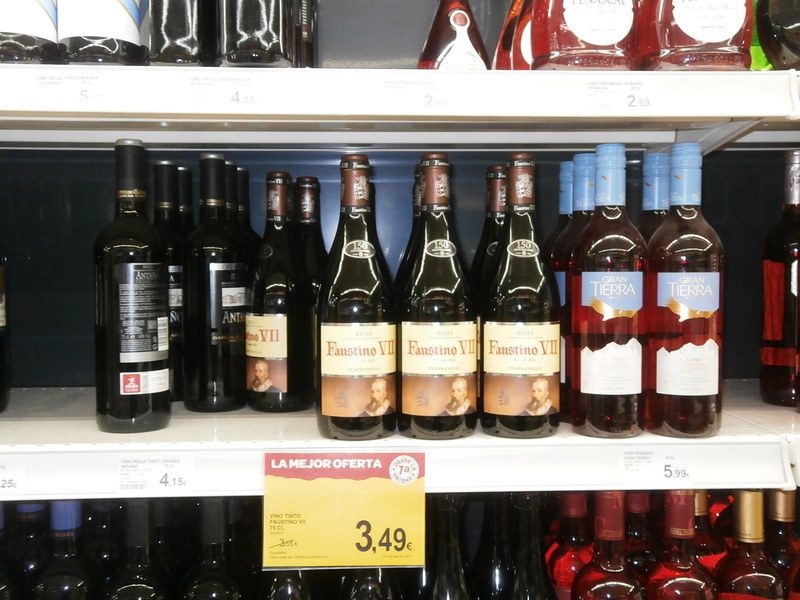 Wine production is so important to the economy of Spain that in the Valencia region vintners have been awarded a 56.6 million euro grant to launch advertising campaigns abroad for 2015-2016. The money can also be used to extend vineyards, buy new machinery, and equipment. They will be targeting sales to the US, China and Mexico. So far 130 projects have been earmarked to be funded. Spanish wine exports increased 39% last year alone with the EU receiving 71% of the exports. 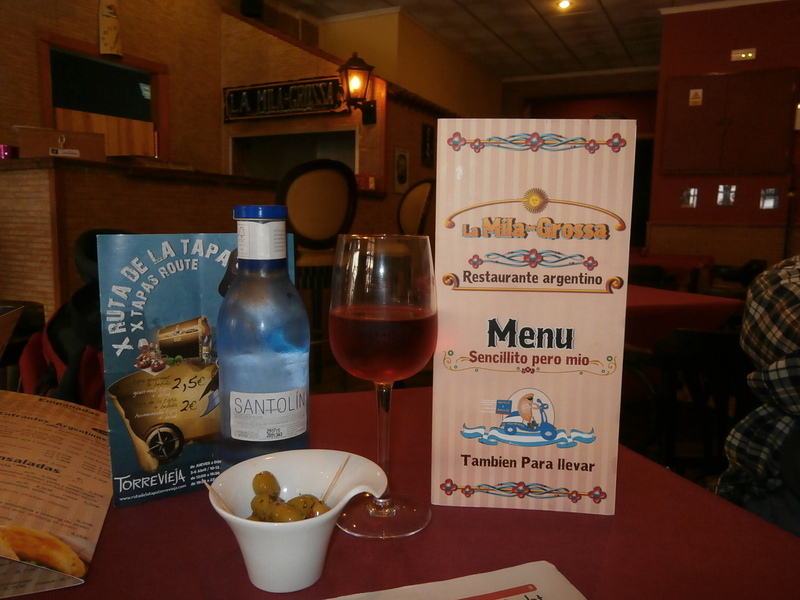 There are many wine tours offered here in Spain. One of the fun experiences that a life of travel affords us comes when we are standing in a liquor store browsing the wine offerings. Mike and I will count the many countries we have traveled too and remember fondly the wines that we sampled while in those countries. While we won’t be able to find any Spanish wines for $1 on the shelves in the United States we know what the quality of the wines will be, so when we get homesick for any of these countries we open a bottle of wine and it helps us to feel less homesick. *Two Buck Chuck is the nickname given to the In-House wine Charles Shaw sold through Trader Joe’s in the United States. Trader Joe’s is the budget friendly half of the Aldi food empire based in Germany. 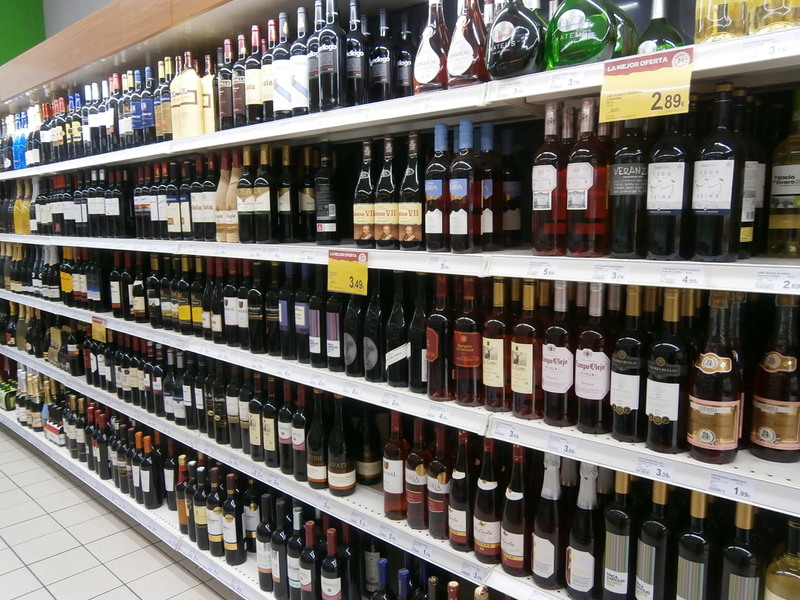 Trader Joe’s has an extensive selection of wines on offer from countries around the world. Perhaps it is because we are American’s that we notice things others might not. We have been traveling through some countries hit pretty hard by the economic collapse. Many of these countries also have monarchies which they are still financially supporting. We have asked many residents in both Spain and the UK why they continue to pay for the monarchy even during these hard economic times. We never get a straight answer as to why, the reaction can be more akin to, ‘well it’s just something that is done’ and ‘how cheeky of us American’s to ask such a question’. 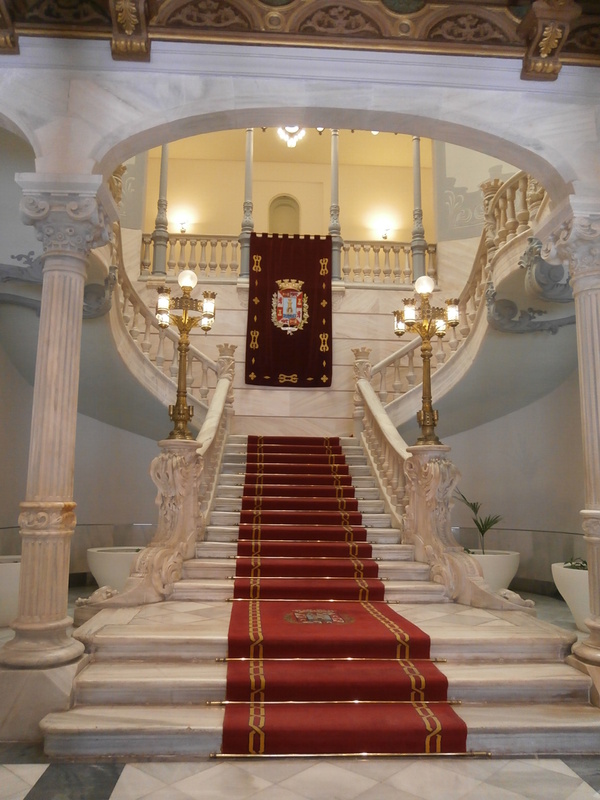 Watching the two hour, low key, swearing in ceremony, military parade and reception for the new King of Spain, Felipe VI, and seeing the Palace Real decked out in its regal splendor, I sat and wondered, what does it cost to keep this pomp and circumstance going? What does it cost for the guards, the cleaning staffs, the royal residences and the every day expenses to keep people in such opulence that literally are paid to wave their hands at the masses assembled on major events, cut ribbons at the opening of buildings, and who slam champagne bottles against the side of ships to christen them. I’m still thinking; nice gig if you can get it. There are three types of monarchies; absolute (where the monarch has no or few legal restraints in state and political matters); constitutional (the monarch maintains a unique legal and ceremonial role, but exercises limited or no political power) and elective (there are three of these still in existence the most famous of which is the Papal appointment in Vatican City). Most countries used a monarch until the 19th Century. In the 20th century after World War I and II many countries abolished them. There are still 44 monarchies in the world today. Only two of them are absolute (the Kings of Swaziland and Saudi Arabia). 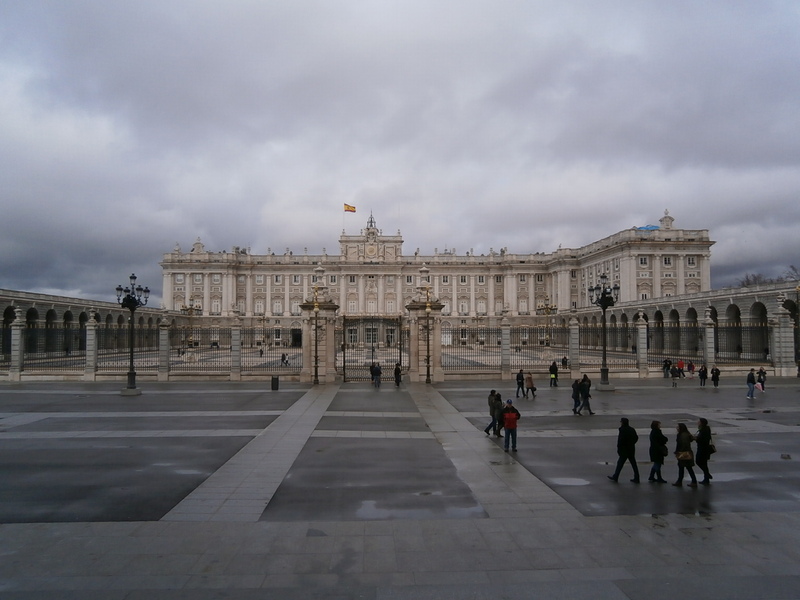 The majority are ceremonial monarchies including those in Spain and the UK. A monarch’s powers and influence depends mostly on tradition, precedent, popular opinion, and law. Popular opinion is now at the forefront of both of the monarchies in the UK and Spain due to the misconduct of the generations that have come after the King or Queen. This misconduct has caused many to question whether the role of the monarchy is worth the money being spent on them. The calls for the monarchy to be abolished here in Spain increased dramatically in the last few years with the abuse of power by King Juan Carlos and also the business cheating scandal of the Infanta Cristina’s husband. The UK has had its share of scandals over the years as well. Juan Carlos I of Spain became King in 1975 after helping to free Spain and depose the fascist rule of Francisco Franco. King Juan Carlos made Spain a democracy with himself as constitutional monarch. He enjoyed many years of high favorability ratings with the people of Spain. The tarnish began to gather on the crown in 2012 when people discovered the king took a luxury elephant-hunting trip to Botswana as they struggled to find jobs in a recession. When the king’s elder daughter Cristina was named a suspect in her husband’s allegedly corrupt business practices the resentment grew to a crescendo and talk began that perhaps it was time to abolish the Monarchy totally. Demonstrations to end the Monarchy are gathering steam here in Spain as the economy worsens. The King then decided, conveniently for health reasons, that it was time to abdicate his throne and hand it down to the younger, good-looking, vibrant Felipe whose approval rating is around 76 percent. This is no coincidence. Most monarchies are hereditary where the position is given in an established order of succession which means that the heir to the throne is known well in advance of becoming monarch to ensure a smooth succession. Most Monarchies however were male heir to male heir no matter their place in the birth order. In 1980, Sweden became the first European monarchy to declare equal primogeniture, meaning that the eldest child of the monarch, whether female or male, ascends to the throne. Many countries have since followed suit such as the UK and this would have begun with any child produced from the union of William and Kate. The British and Spanish Royal Families are financed mainly by public money. Both Governments meet the cost of the Sovereign’s official expenditure from public funds including the costs of the upkeep of the various royal residences, staffing, travel and state visits, public engagements, and official entertainment. In 2012 the Queen received £7.9 Million pounds ($12.64 Million) to perform her duties. The King of Spain received 7.8 million Euros ($10.14 Million) for fiscal year 2014. The costs to run the rest of the empire in the UK in 2009 were £41.5 million ($66.4 Million), which did not include the cost of security provided by the police and the Army. In the UK the Queen and her family feed off multiple revenue schemes. In addition to her salary she feeds off the profits of the Duchy of Lancaster for expenses not borne by the Sovereign Grant. In 2010 they received £13 Million pounds ($20.8 Million) in income. This has to beg the question; what expenses? So far the Queen doesn’t pay for the upkeep of the palaces, the staff to keep the palaces running or for the security to keep her safe. 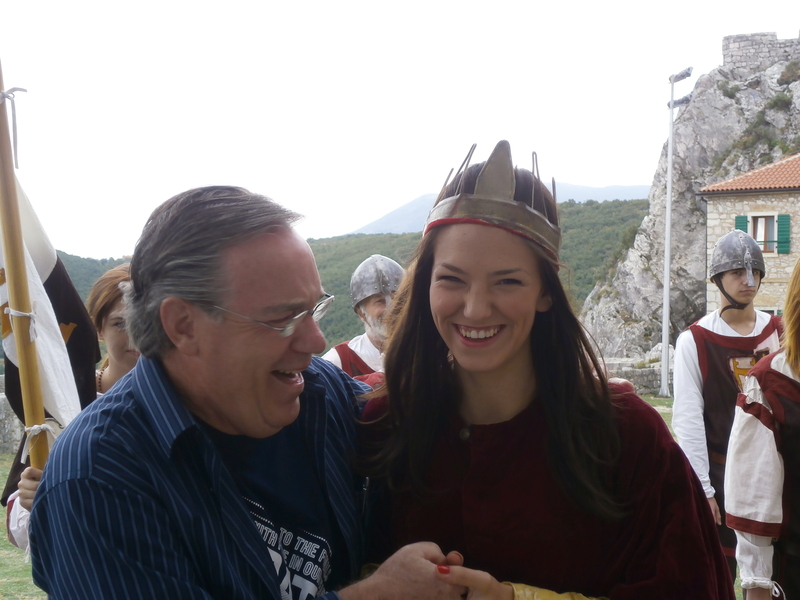 The money from the Duchy is in addition to her stipend as Queen. The madness doesn’t stop here however because The Duchy of Cornwall is a property portfolio held in trust for the people of England but used to meet the expenses of the monarch’s eldest son, the Prince of Wales, who receives revenue from it to pay for his official activities and property. Also feeding off this fund are his wife (the incredibly disliked Camilla), his son Williams’ entire family and his second son Harry, who all have their official expenses paid from Duchy income. For the fiscal year 2011-12 the Duchy paid Charles £18.3 million ($29.28 Million). Seriously, is Charles worth 18.3 million pounds? Even the Duke of Edinburgh (the Queen’s husband) receives the princely sum of £359,000 per year from the Treasury ($574,400). What exactly does he need to draw a salary for since all of his other expenses are covered? Isn’t anyone adding up the real cost of the Monarchy to the people who are supporting it? The Queen is reportedly worth $450 Million dollars based on personal real estate, jewelry and other assets. The King of Spain has not had his personal wealth disclosed. Neither sovereign is transparent in the filing of their income taxes so no one really knows how much either one is really worth. Would the CEO of any major corporation be allowed such secrecy? If one takes away the need to fund the Monarch’s and just let them exist on their own wealth the countries could put that money to better use by building a better medical environment for the poor, fund food and other lifestyle programs for the needy, perhaps even decrease the tax structure of the country as a whole; it is staggering to think of the programs that could be funded. It is hard as an outsider to see the poverty in the streets in these countries and then to see the pomp and opulence of the palaces that exist and wonder why would anyone continue to fund the lifestyle of those that can afford to live on their own while those that cannot feed their families beg for food or coin in the streets. Or am I the only one who finds this absurd in this day and age? Yes, the new Royal Family here in Spain is incredibly good looking, youthful and of good moral character. And William, Kate and little George are wonderful in the UK. If the people in these countries insist on keeping the hand waving monarchies going who am I to pooh pooh their loyalty. Back in the United States I will keep abreast of the activities of both Monarchies and secretly I’ll be hoping that Elizabeth II will find a way to abdicate, and give the crown to William, but there’s that cheeky American thing again. Some cities are automatically on our travel radar; Madrid, Barcelona, Seville. 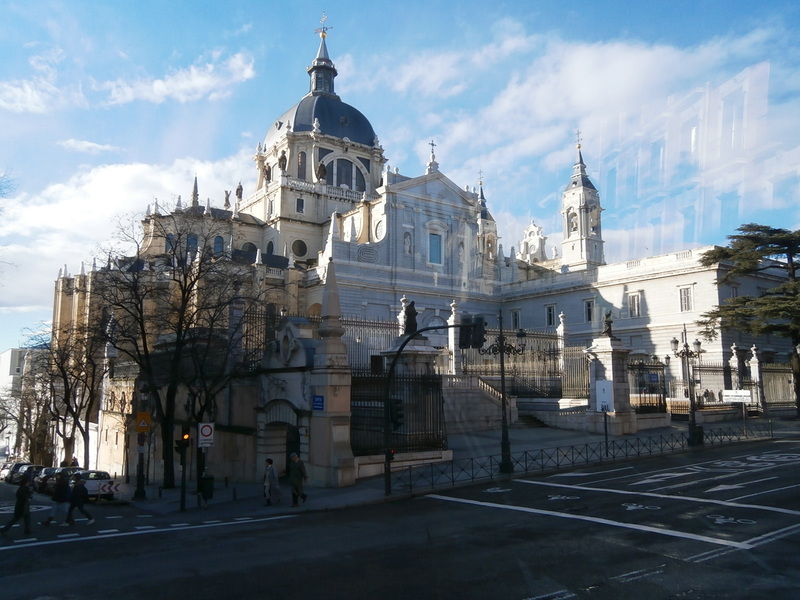 Some cities are added as we learn more about an area, and a small city like Pilar de la Horadada which might not otherwise have made it on our travel wish list we were drawn to visit after meeting a couple of fellow expats who call this city home. New friends Ruth and Mick came from the UK 12 years ago and settled on life here in Pilar. 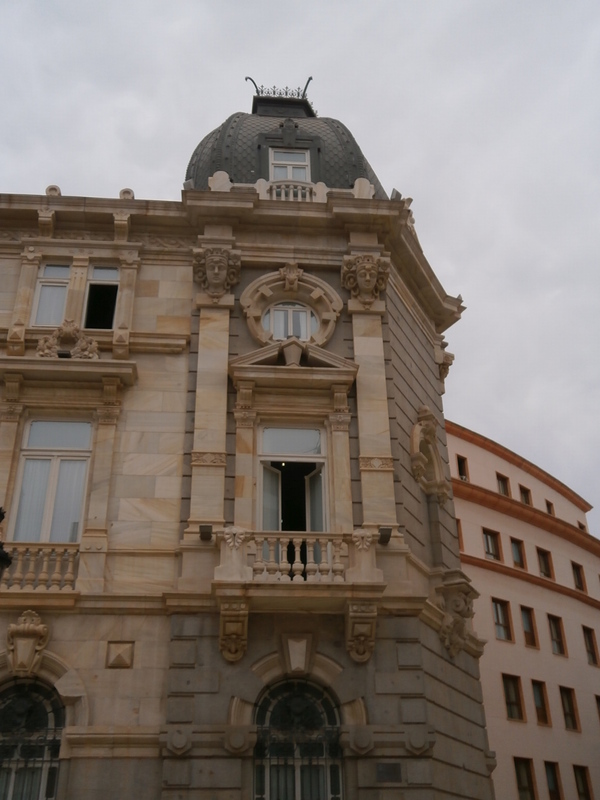 Pilar is the southernmost city in the Valencia region of Spain. 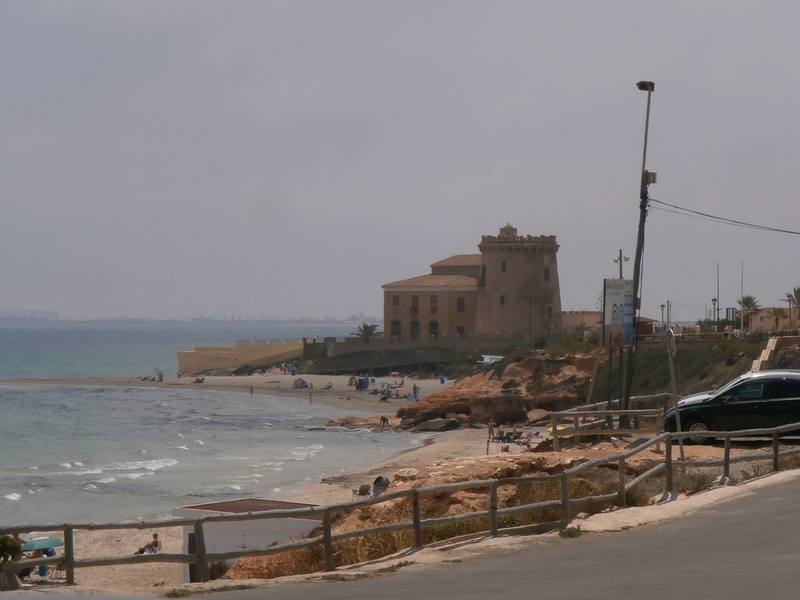 It was less than a two hour bus ride from our base here in Torrevieja. During Roman times Pilar was called “Thiar’s Mansion” and was a trading post situated at the foot of the Via Augusta, one of the oldest and most important Roman roads in Hispania. 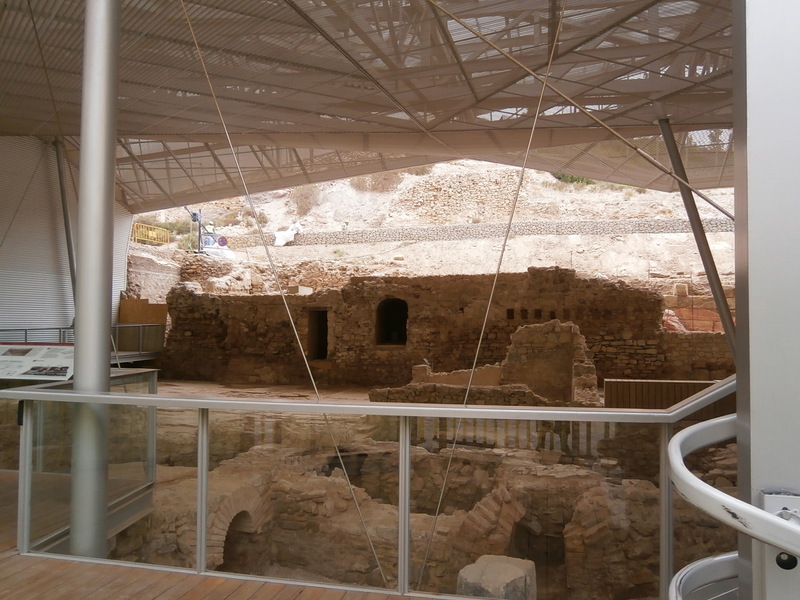 It is believed that this was the main route between Illici (Elche) and Carthago Nova (Cartagena). Pilar was settled by the Moors in the 8th Century and remained under Muslim control until the 13th Century. Between the 13th and the 17th Centuries this region saw many attacks by pirates. The Watchtower of the nearby village of Torre de la Horadada was built in the 15th Century to protect the inhabitants from pirate attacks. The beach along this area of Spain stretch’s for over 4 kilometers and the crystal clear blue waters and the good visibility the sea offers provides a great location for scuba diving. For their added pleasure off the coast is a sunken wreck which can be explored by the most experienced of divers. 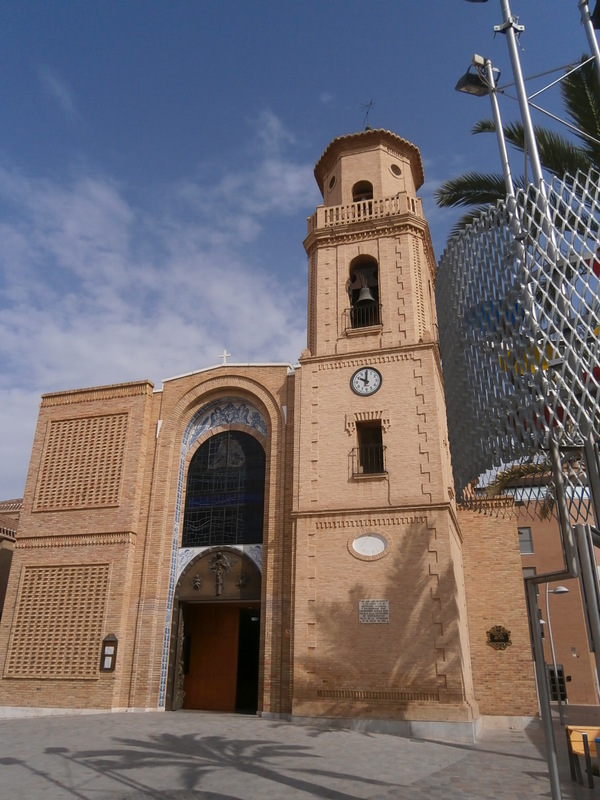 In the main town square stands the Our Lady of the Virgin of Pilar Roman Catholic Church. The present church stands on the site of a chapel built in 1616. That chapel was demolished in 1745 but rebuilt in 1752. That church stood until 1975 when it too needed to be demolished. The present church seen today was built in 1982. The bell tower was built in 1899 and stands at a height of 24 meters. The bell tower houses four large and several smaller bells. Pilar is a very expat friendly city with the majority of expats coming from the UK, Germany, Norway and Canada and the population of the area is around 25,000. Most of the region is holiday housing so on the day we visited we were the only people in the complex where Ruth and Mick live. 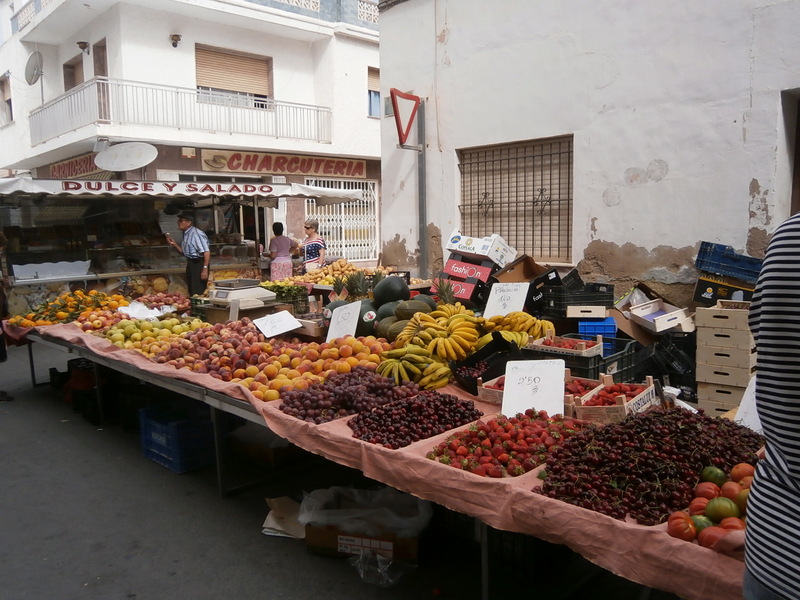 Every Friday the city hosts a Farmer’s Market and we timed our visit to coincide with market day. 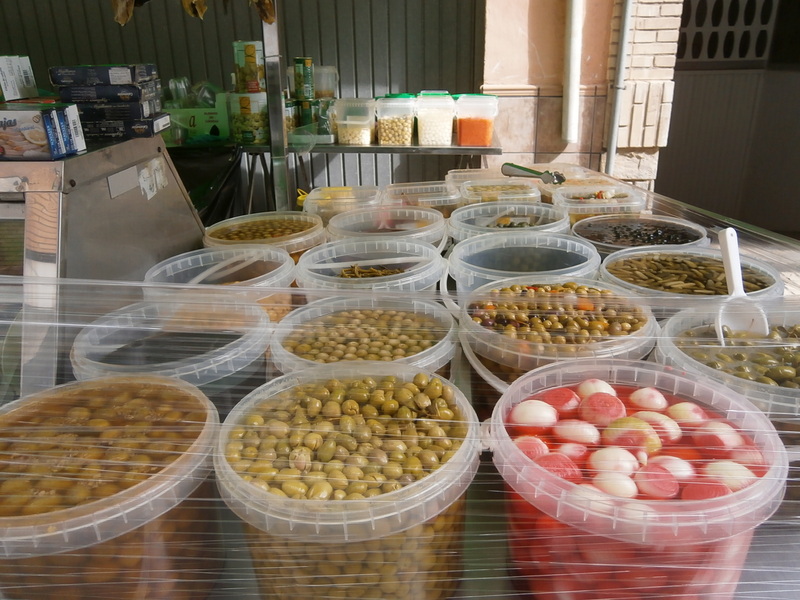 There was a wonderful selection of fresh fruits, vegetables, dry goods, clothing, cooked meats, candies and baked goods. Mike loved the fresh cherries he bought and I love the new house dress I got. Pilar is on the famous Camino de Santiago. 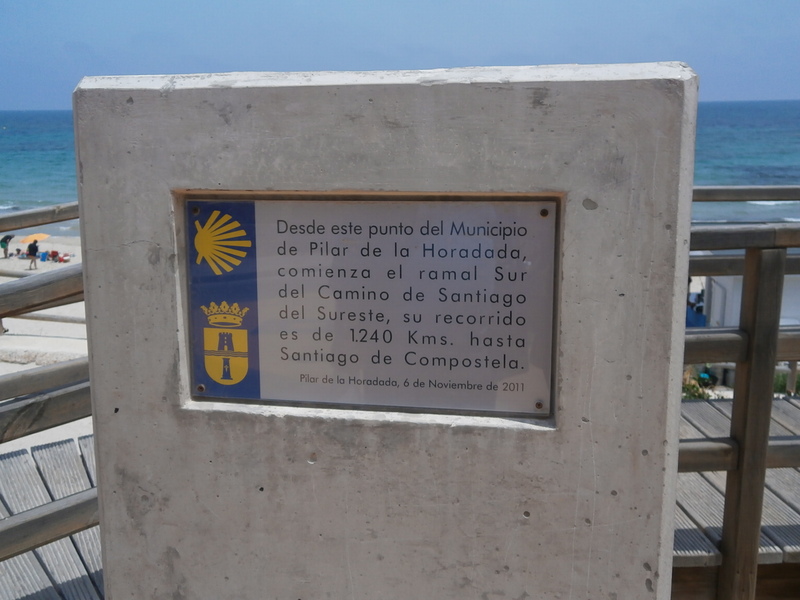 Rough translation of the photo says, ‘from this point in the city of Pilar de la Horadada is the beginning of the southern route of the Camino de Santiago of the southeast. Its distance is 1240 kilometers (740 miles) to Santiago de Compostela’ (the location of St. James Church in Santiago, Spain). Pilar has a laid back and quiet vibe, beautiful beaches, plenty of restaurants to choose from, easy to walk streets and good public transportation. They even have a senior center where seniors gather to get a hot noon day meal. Our time spent with Ruth and Mick always seems to fly by and we never seem to run out of things to talk about, so when they suggested we come to Pilar so they could show us around their little town we jumped at the chance. On this day we spent 8 hours walking, talking, exploring, and taking pictures, lots and lots of pictures of this small coastal town. While Pilar does have tourist attractions and would make a worthwhile stop for other travelers what made our time in Pilar so special was the time we got to spend with new friends, and that is something that you won’t find in any guide book. From our home base here in Spain we are less than an hour’s drive from the ancient city of Cartagena. 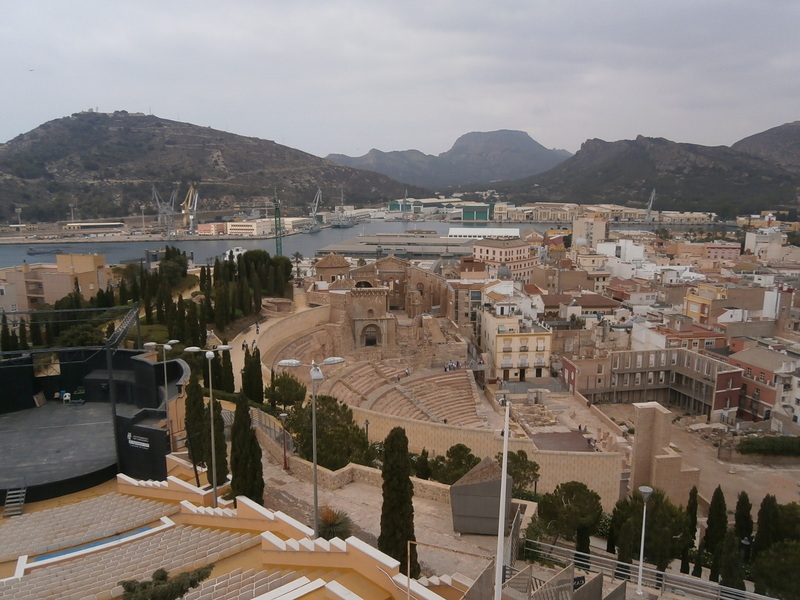 Cartagena is a port city located in the southeasterly coastal area of Spain. It has been inhabited since 227 BC. Being a most advantageous Mediterranean seaport helped to grow Cartagena’s importance to the local economy of the region and also helped to make it the epicenter of the Spanish Navy. Even present day this is still an important naval seaport, the main military haven of Spain, and home to a naval shipyard. 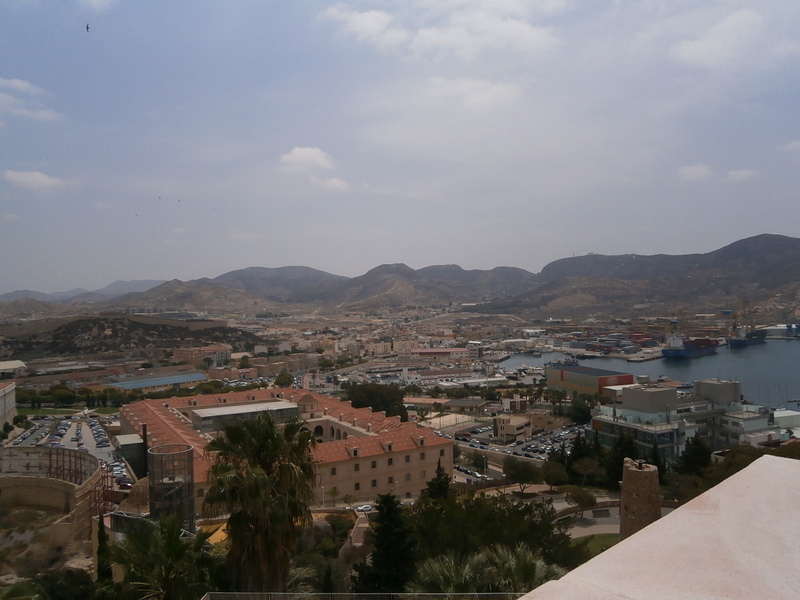 With such a long history and being such an important port Cartagena was conquered by many people such as the Romans, the Phoenicians, the Byzantines even the Moors. Cartagena was limited in its boundaries by five small hills which also acted to protect the city from attack. 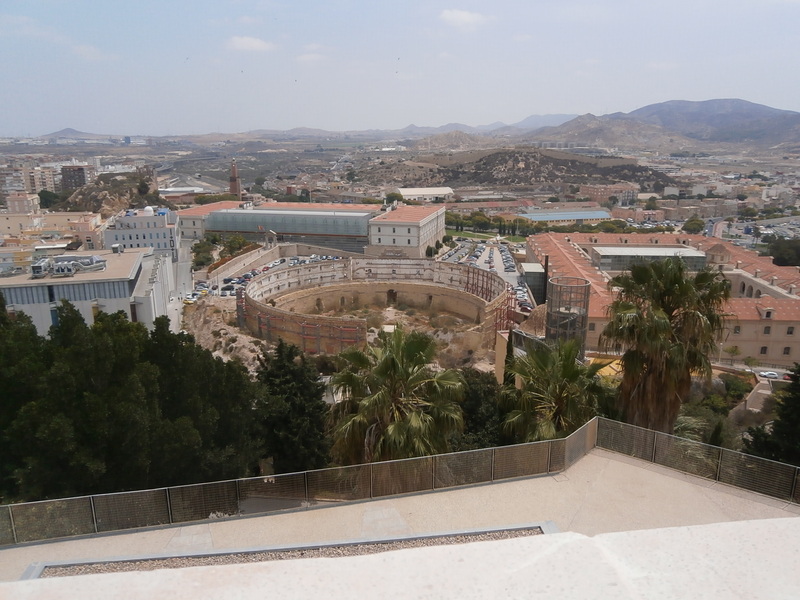 So important was Cartagena to Roman expansion that Julius Caesar gave the town Latin Rights and the city was central to the Carthaginian and the Roman conquest of the Iberian Peninsula. 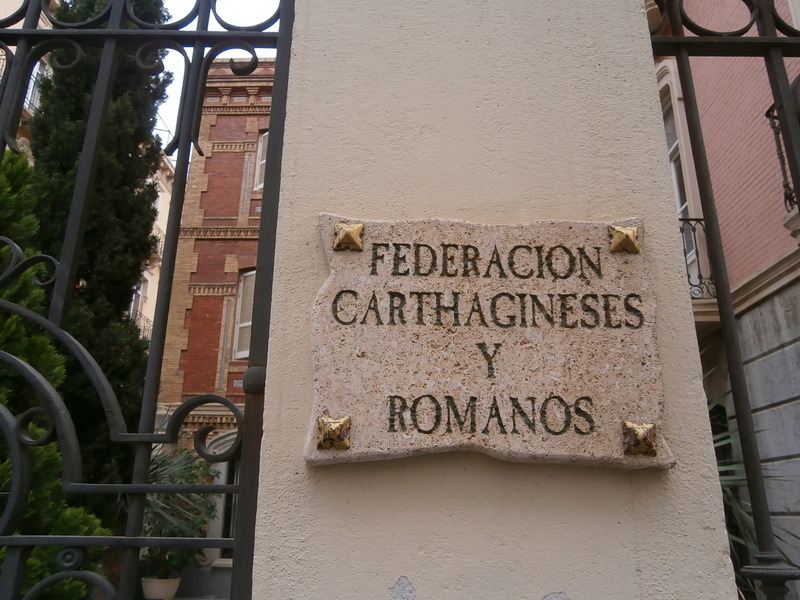 In 298 AD Diocletian (famed for Diocletian’s Palace in Split, Croatia) constituted a new Roman province in Hispania called Carthaginensis and made Cartagena the capital. During the turbulent years to come this region of Spain was ruled by many factions. In 1245 King Alfonso X of Castile (Alfonso the Wise) conquered Cartagena. 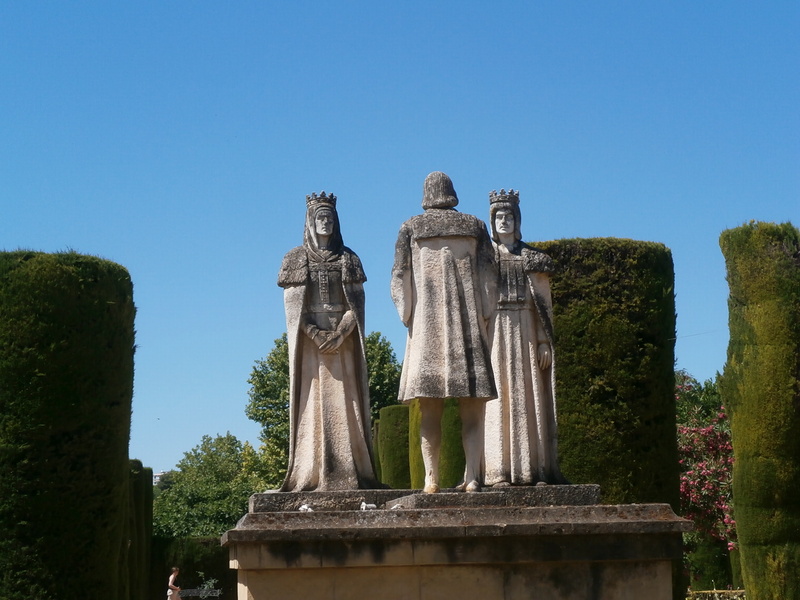 In 1270 he created the Order of Santa Maria de Espania for naval defense of the Crown of Castile and established its headquarters here which is where it still remains. Cartagena is also a cruise ship port. One to three ships dock here every week from March until about November. Cartagena also has 10 beaches, the most of any Spanish city. 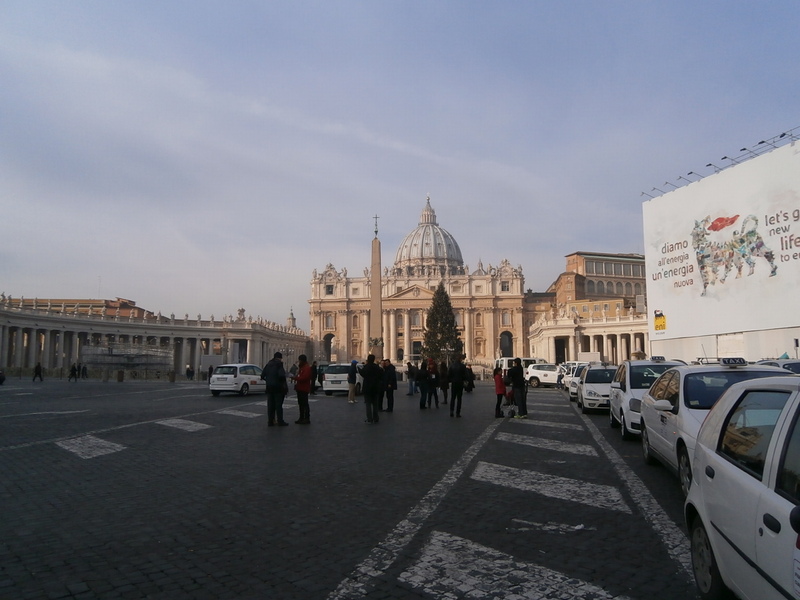 For the princely sum of 12.50 Euros a person, a tourist can get a three for one all day tourism ticket. 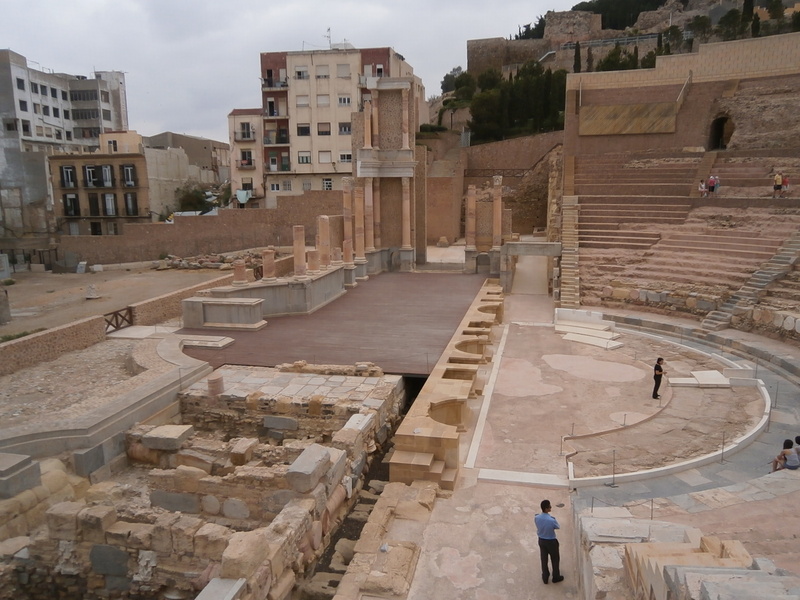 Included in the price is a visit to the Roman Theatre, a ride on the Cartagena tourism bus (a 40 minute ride around the city with recorded commentary on the city’s history) and entrance to Concepcion Castle, which is today the Centre for Interpretation of the History of Cartagena. If you have one day to spend in the city and you don’t mind walking a bit this inclusive tourism ticket is well worth the expense. Not included in the ticket is entrance to the Naval Museum and other items of note around the city but all of the main attractions of the city are located within a few minutes walk of each other. You can literally see all of old Cartagena in a day’s time. Before returning home we stopped in the tiny town of Los Nietos and walked the short distance to the Mar Menor beach front. 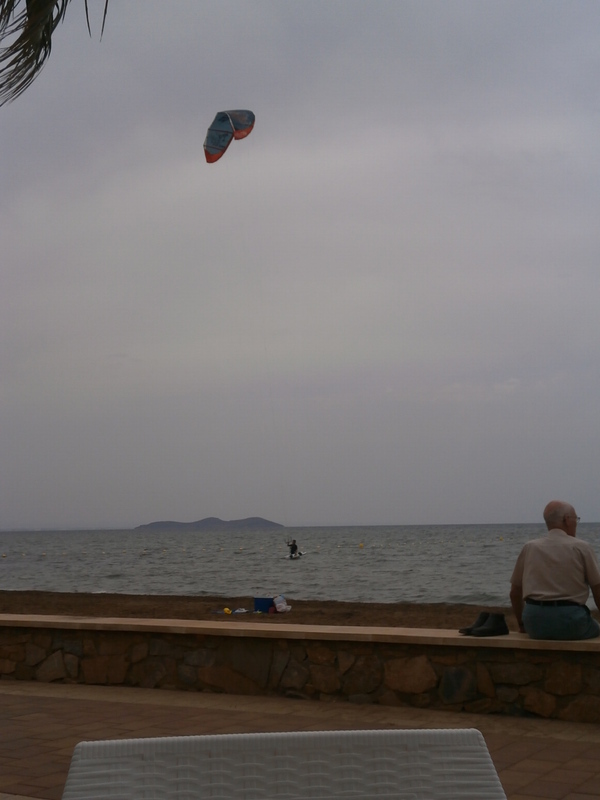 The Mar Menor is a salty lagoon separated from the Mediterranean by a sand bar. 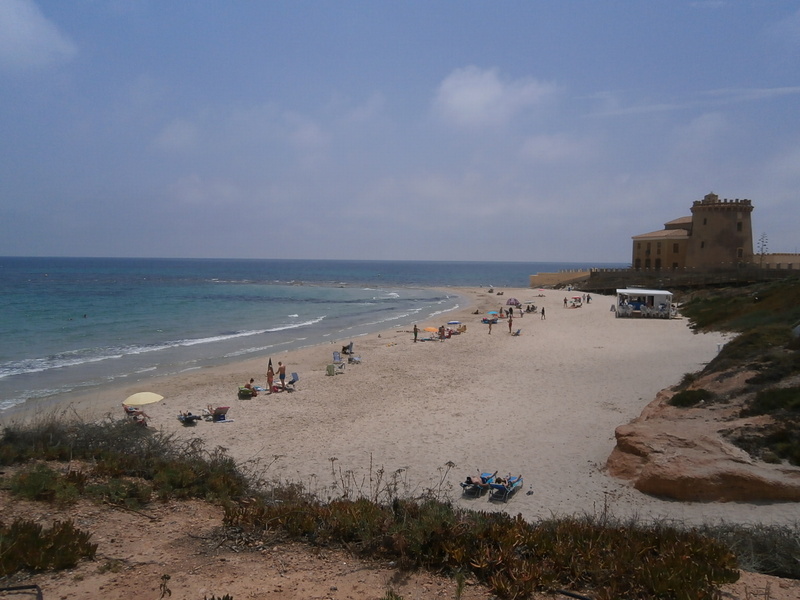 It has warm and clear waters with high salinity, and incredibly high winds perfect for wind surfing. This inlet has been sanctioned by the United Nations as a protected area and along its coast line you can see the five volcanic islands (Perdiguera, Mayor or del Barón, del Ciervo, Redonda and del Sujeto). 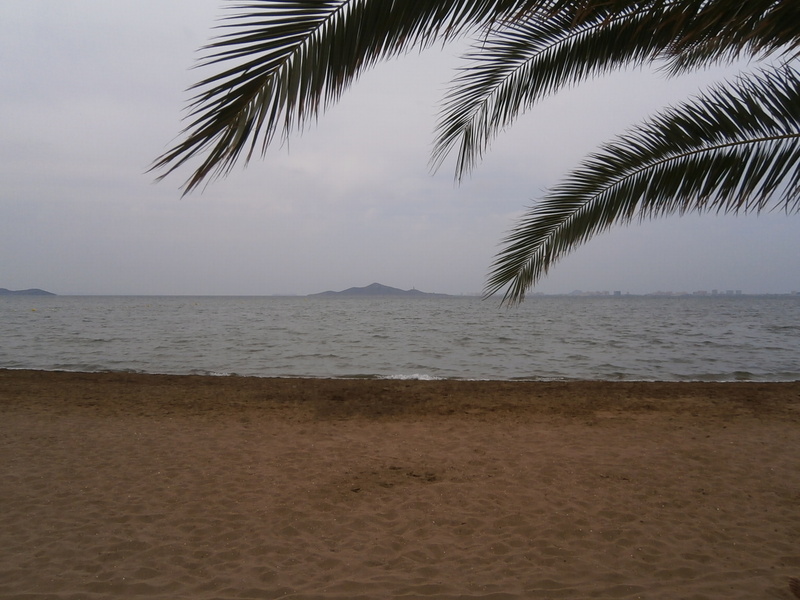 The Mar Menor is Europes largest salt water lake. 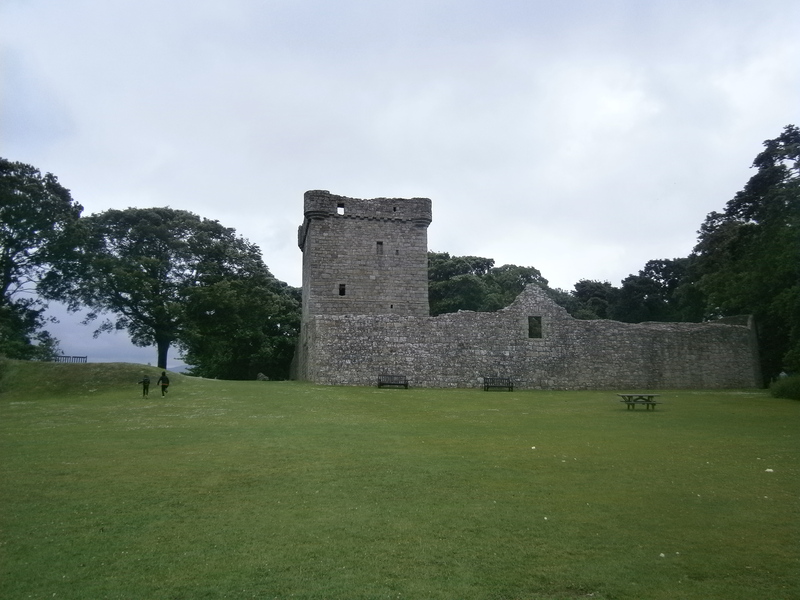 It has been inhabited since the Palaeolithic Era. Today the Mar Menor is a major tourism center and many of the hotels found along the inlet are first class resorts.